Occupying a prime seafront location on Sunny Isles Beach, Florida, Turnberry Ocean Club offers modern luxury tower living with a huge array of amenities. Due for completion in spring 2020, the development's most luxurious offering is a 19,160 square foot triplex occupying the top three floors of the tower. Boasting six bedrooms and nine and a half bathrooms, the triplex benefits from a private elevator entrance as well as huge open plan entertaining areas, a large family room, private gym, games room, bar with wine cellar, formal dining room, pantry and staff quarters. Large balconies to the east and west are ideal for making the most of both sunrise and sunset while a private rooftop space offers a swimming pool and summer kitchen. Residents at Turnberry Ocean Club also gain access to a whole host of amenities including direct access to the recently refurbished Turnberry Marina which offers 117 berths for yachts up to 55 metres. Elsewhere residents also gain privileged service at the Fontainebleu Aviation Luxe Facility and a year's membership to the Turnberry Isle Resort's country club including its two golf courses, tennis courts, waterpark and fine dining restaurants. On site, Turnberry Ocean Club also offers a full time valet and concierge, oceanview pool with full service, beach service, pool bar, reading lounge, screening room, meeting room, stock trading lounge, games room and kids' club. The residents' only Sky Club located on floors 30-32 is also home to sunrise and sunset swimming pools, two hydrotherapy spas, a fitness centre, outdoor gym, yoga studio, steam room, sauna, nail salon, spa with treatment room, bar, indoor and outdoor dining areas, lounge and function room. The triplex residence at Turnberry Ocean Club is listed for sale for $35 million Turnberry Associates and One Sotheby's International Realty. Occupying a prime seafront location on Sunny Isles Beach, Florida, Turnberry Ocean Club offers modern luxury tower living with a huge array of amenities. Due for completion in spring 2020, the development's most luxurious offering is a 19,160 square foot triplex occupying the top three floors of the tower. Boasting six bedrooms and nine and a half bathrooms, the triplex benefits from a private elevator entrance as well as huge open plan entertaining areas, a large family room, private gym, games room, bar with wine cellar, formal dining room, pantry and staff quarters. Large balconies to the east and west are ideal for making the most of both sunrise and sunset while a private rooftop space offers a swimming pool and summer kitchen. Residents at Turnberry Ocean Club also gain access to a whole host of amenities including direct access to the recently refurbished Turnberry Marina which offers 117 berths for yachts up to 55 metres. Elsewhere residents also gain privileged service at the Fontainebleu Aviation Luxe Facility and a year's membership to the Turnberry Isle Resort's country club including its two golf courses, tennis courts, waterpark and fine dining restaurants. On site, Turnberry Ocean Club also offers a full time valet and concierge, oceanview pool with full service, beach service, pool bar, reading lounge, screening room, meeting room, stock trading lounge, games room and kids' club. The residents' only Sky Club located on floors 30-32 is also home to sunrise and sunset swimming pools, two hydrotherapy spas, a fitness centre, outdoor gym, yoga studio, steam room, sauna, nail salon, spa with treatment room, bar, indoor and outdoor dining areas, lounge and function room. The triplex residence at Turnberry Ocean Club is listed for sale for $35 million Turnberry Associates and One Sotheby's International Realty. While this spacious six-bedroom apartment on Providence Island in the Bahamas may not come equipped with its own superyacht berth it does occupy a prime position overlooking the marina at Albany - which can accommodate yachts up to 73 metres - making it a brilliant investment opportunity for owners looking to keep their yachts in this popular cruising destination. Located on the fifth floor of the Orchid Building in the exclusive Albany resort, a project realised by investment firm Tavistock Group along with Joe Lewis, Tiger Woods, Ernie Els and Justin Timberlake, the apartment features interior design by Finchatton and spans more than 11,000 square feet of internal and external living space. Along with the six large bedrooms, including a master suite with study, dressing room, bathroom and private terrace with bar and Jacuzzi, there are six bathrooms, a dining room, modern kitchen, outdoor kitchen, media room and a large living area with panoramic ocean views leading on to a terrace. Residents at Albany also enjoy access to a number of amenities including numerous restaurants, adult and family swimming pools, a water playground, tennis court, golf course, gym with lap pool and fitness classes, spa, equestrian and water sports facilities and private parking. Orchid Apartment V is listed for sale for $24 million with Douglas Elliman. While this spacious six-bedroom apartment on Providence Island in the Bahamas may not come equipped with its own superyacht berth it does occupy a prime position overlooking the marina at Albany - which can accommodate yachts up to 73 metres - making it a brilliant investment opportunity for owners looking to keep their yachts in this popular cruising destination. Located on the fifth floor of the Orchid Building in the exclusive Albany resort, a project realised by investment firm Tavistock Group along with Joe Lewis, Tiger Woods, Ernie Els and Justin Timberlake, the apartment features interior design by Finchatton and spans more than 11,000 square feet of internal and external living space. Along with the six large bedrooms, including a master suite with study, dressing room, bathroom and private terrace with bar and Jacuzzi, there are six bathrooms, a dining room, modern kitchen, outdoor kitchen, media room and a large living area with panoramic ocean views leading on to a terrace. Residents at Albany also enjoy access to a number of amenities including numerous restaurants, adult and family swimming pools, a water playground, tennis court, golf course, gym with lap pool and fitness classes, spa, equestrian and water sports facilities and private parking. 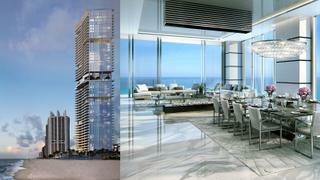 Orchid Apartment V is listed for sale for $24 million with Douglas Elliman. Looking for superyacht-style luxury outside the usual American hotspots? This vast new build boasts a prime waterfront position in the upmarket Rumson area of New Jersey offering the perfect home for yacht-owning families. Designed by architect Robert D. Henry in conjunction with the Monteforte Architectural Studio, with interior design by New York-based Molly Elizabeth and lighting by Atelier Lumiere, the property boasts eight large bedrooms, nine bathrooms and three half bathrooms. Designed to make the most of the gorgeous views over the Shrewsbury River and ocean, the property's new owner can also enjoy a host of entertaining and relaxation areas including an expansive kitchen, wine cellar large enough for private dinners, a cinema, fitness centre and indoor spa with plunge pool, sauna, steam room and massage room. Outside, manicured lawns play host to a large swimming pool and patio while the property's 120 feet of private waterfront are ideal for swimming or mooring yachts. 27 Ward Ave is listed for sale for $9,950,000 with Douglas Elliman. Looking for superyacht-style luxury outside the usual American hotspots? This vast new build boasts a prime waterfront position in the upmarket Rumson area of New Jersey offering the perfect home for yacht-owning families. Designed by architect Robert D. Henry in conjunction with the Monteforte Architectural Studio, with interior design by New York-based Molly Elizabeth and lighting by Atelier Lumiere, the property boasts eight large bedrooms, nine bathrooms and three half bathrooms. Designed to make the most of the gorgeous views over the Shrewsbury River and ocean, the property's new owner can also enjoy a host of entertaining and relaxation areas including an expansive kitchen, wine cellar large enough for private dinners, a cinema, fitness centre and indoor spa with plunge pool, sauna, steam room and massage room. 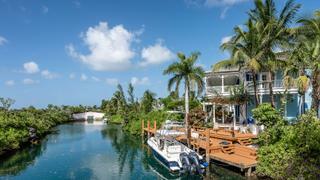 Outside, manicured lawns play host to a large swimming pool and patio while the property's 120 feet of private waterfront are ideal for swimming or mooring yachts. 27 Ward Ave is listed for sale for $9,950,000 with Douglas Elliman. Located in Old Fort Bay, one of Nassau's most exclusive private communities, this expansive estate is the ideal vacation investment for seafaring families. Spanning 32,760 square feet, the property features a large main house with three bedrooms and three and a half bathrooms along with a large kitchen, formal dining room, airy living spaces and 2,400 square feet of covered verandahs with views over the neighbouring canal. A generous guest apartment offers a further bedroom, bathroom and covered porches for drinks and dining. Outside the lush gardens are complemented by a swimming pool and 250 feet of canal frontage with a private mooring, ideal for keeping a day boat or tender to take you to a larger anchored yacht. The property's new owner will also enjoy all the perks of the Old Fort Bay community including a residents' gym, restaurant, swimming pool and access to Old Fort Beach. 1 Dunmore Island is listed for sale for $2,995,000 with Damianos Sotheby's International Realty. Located in Old Fort Bay, one of Nassau's most exclusive private communities, this expansive estate is the ideal vacation investment for seafaring families. Spanning 32,760 square feet, the property features a large main house with three bedrooms and three and a half bathrooms along with a large kitchen, formal dining room, airy living spaces and 2,400 square feet of covered verandahs with views over the neighbouring canal. A generous guest apartment offers a further bedroom, bathroom and covered porches for drinks and dining. Outside the lush gardens are complemented by a swimming pool and 250 feet of canal frontage with a private mooring, ideal for keeping a day boat or tender to take you to a larger anchored yacht. The property's new owner will also enjoy all the perks of the Old Fort Bay community including a residents' gym, restaurant, swimming pool and access to Old Fort Beach. 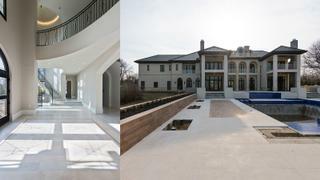 1 Dunmore Island is listed for sale for $2,995,000 with Damianos Sotheby's International Realty. As close as you'll come to owning a home with its own yacht mooring in the heart of London, the South Quay Plaza luxury residential development is perched on the waterfront at Canary Wharf where berths for yachts up to 170 metres are just moments away (recent visitors to the area have included 95 metre Lürssen Kismet). Of course, the development's proximity to London's financial district also makes it ideal for those looking for a business base and, with apartments of up to three bedrooms on offer, can also create great family homes. Designed by internationally renowned architect Foster + Partners, South Quay Plaza sits within 2.6 acres of private landscaped grounds and offers breathtaking views over London. As well as close proximity to local fine dining restaurants and high-end shopping, every resident also has access to a 24-hour concierge, 56th floor residents' lounge with terrace, bar and kitchen, a boardroom, library and screening room. The Quay Club is also available exclusively to owners and offers state-of-the-art leisure facilities including a 20 metre swimming pool, vitality pool, sauna, steam room, fitness centre and yoga studio. Three bedroom apartments at South Quay Plaza start from £1,705,000 with Berkeley. As close as you'll come to owning a home with its own yacht mooring in the heart of London, the South Quay Plaza luxury residential development is perched on the waterfront at Canary Wharf where berths for yachts up to 170 metres are just moments away (recent visitors to the area have included 95 metre LürssenKismet). Of course, the development's proximity to London's financial district also makes it ideal for those looking for a business base and, with apartments of up to three bedrooms on offer, can also create great family homes. Designed by internationally renowned architect Foster + Partners, South Quay Plaza sits within 2.6 acres of private landscaped grounds and offers breathtaking views over London. As well as close proximity to local fine dining restaurants and high-end shopping, every resident also has access to a 24-hour concierge, 56th floor residents' lounge with terrace, bar and kitchen, a boardroom, library and screening room. The Quay Club is also available exclusively to owners and offers state-of-the-art leisure facilities including a 20 metre swimming pool, vitality pool, sauna, steam room, fitness centre and yoga studio. 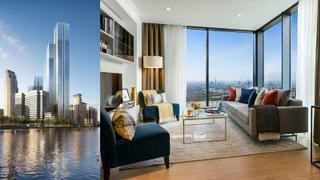 Three bedroom apartments at South Quay Plaza start from £1,705,000 with Berkeley. Boasting two moorings capable of berthing yachts up to 35 metre and 40 metres respectively, Neso Villa really does combine the best of both worlds. The jewel in the crown of the newly built luxury residences at Limassol Marina, the villa is located on a private island accessed by bridge and offers 1,220 square metres of indoor and outdoor space with lush landscaped garden and panoramic views across the marina and out to sea. Inside, the residence flows across four floors and offers five en-suite bedrooms, study, TV room, numerous living spaces and a cellar and gym that open out on to the extensive terraces, sundecks and courtyards beyond. There is also a swimming pool, guest house and private parking while residents will have full access to the marina's spa, fitness club, restaurants and high-end shopping. The berths themselves come with all the benefits of a world-class full service marina and are managed by F&S Marinas and Camper & Nicholsons Marinas. Facilities include round-the-clock security, CCTV, fresh water, concierge, internet and use of the marina's fuel station, helipad and maintenance offerings. Neso Villa is listed for sale with Limassol Marina for €13,900,000. Boasting two moorings capable of berthing yachts up to 35 metre and 40 metres respectively, Neso Villa really does combine the best of both worlds. The jewel in the crown of the newly built luxury residences at Limassol Marina, the villa is located on a private island accessed by bridge and offers 1,220 square metres of indoor and outdoor space with lush landscaped garden and panoramic views across the marina and out to sea. Inside, the residence flows across four floors and offers five en-suite bedrooms, study, TV room, numerous living spaces and a cellar and gym that open out on to the extensive terraces, sundecks and courtyards beyond. There is also a swimming pool, guest house and private parking while residents will have full access to the marina's spa, fitness club, restaurants and high-end shopping. The berths themselves come with all the benefits of a world-class full service marina and are managed by F&S Marinas and Camper & Nicholsons Marinas. Facilities include round-the-clock security, CCTV, fresh water, concierge, internet and use of the marina's fuel station, helipad and maintenance offerings. 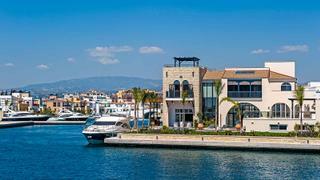 Neso Villa is listed for sale with Limassol Marina for €13,900,000. 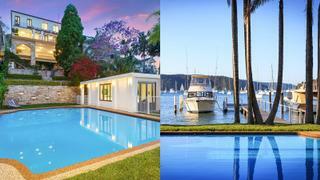 Situated on the highly sought after waterfront at Pittwater, La Dolce Vita lays claim to a prime sheltered spot on Salt Pan Point with views over the bay and to the national park beyond. Boasting three large bedrooms and three bathrooms, the three-storey main residence takes its architectural cues from the Mediterranean while a separate studio offers the perfect place for a guest suite or private office. The main residence also offers a large lounge with fire, formal dining room, kitchen outfitted with Gaggenau appliances, casual dining area, second kitchenette, billiards area and multiple outdoor terraces and balconies. The property also features extensive grounds including 253 square metres of waterways licence with a private jetty for yachts up to 12 metres, boatshed with kitchenette and bathroom, slipway, private beachfront, seawater pool and landscaped gardens and is within easy reach of the local Royal Motor Yacht Club. La Dolce Vita is listed for sale with Christie's International Real Estate with price on application. Situated on the highly sought after waterfront at Pittwater, La Dolce Vita lays claim to a prime sheltered spot on Salt Pan Point with views over the bay and to the national park beyond. Boasting three large bedrooms and three bathrooms, the three-storey main residence takes its architectural cues from the Mediterranean while a separate studio offers the perfect place for a guest suite or private office. The main residence also offers a large lounge with fire, formal dining room, kitchen outfitted with Gaggenau appliances, casual dining area, second kitchenette, billiards area and multiple outdoor terraces and balconies. The property also features extensive grounds including 253 square metres of waterways licence with a private jetty for yachts up to 12 metres, boatshed with kitchenette and bathroom, slipway, private beachfront, seawater pool and landscaped gardens and is within easy reach of the local Royal Motor Yacht Club. La Dolce Vita is listed for sale with Christie's International Real Estate with price on application. With 500 feet of private dock and more than 950 feet of waterfront, the Peninsula Estate at Crystal Harbour, Grand Cayman is every ocean lovers paradise. Located on 1.75 acres of grounds in a private compound, this remarkable property boasts six luxurious bedrooms and 10 bathrooms, a 700 bottle wine cellar, two pool bars in the huge private pool and no fewer than 21 outdoor terraces. Perfect for parties, the Peninsula Estate also offers a second building containing a private theatre and bar, as well as a 24-seat waterfront amphitheatre, air conditioned garage for five cars, sky bar and landscaped gardens featuring a 45 foot Koi pond. Easy access to world-class dining, golf courses and a private airport make this the perfect traveller's retreat from which to enjoy the Caribbean. The Peninsula Estate is for sale with Christie's International Real Estate with price on application. With 500 feet of private dock and more than 950 feet of waterfront, the Peninsula Estate at Crystal Harbour, Grand Cayman is every ocean lovers paradise. Located on 1.75 acres of grounds in a private compound, this remarkable property boasts six luxurious bedrooms and 10 bathrooms, a 700 bottle wine cellar, two pool bars in the huge private pool and no fewer than 21 outdoor terraces. Perfect for parties, the Peninsula Estate also offers a second building containing a private theatre and bar, as well as a 24-seat waterfront amphitheatre, air conditioned garage for five cars, sky bar and landscaped gardens featuring a 45 foot Koi pond. Easy access to world-class dining, golf courses and a private airport make this the perfect traveller's retreat from which to enjoy the Caribbean. 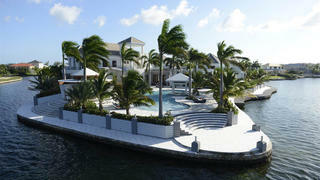 The Peninsula Estate is for sale with Christie's International Real Estate with price on application. This recently completed development on Miami's famous private Fisher Island boasts 43 high-end residences each with access to two private deep-water marinas which can accommodate yachts up to 76 metres. Apartments are available with between three and seven bedrooms, the largest of which come complete with private gyms, terraces and theatres. 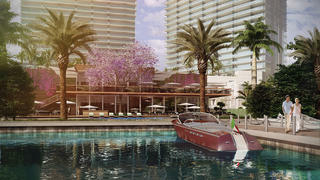 Every resident also has access to Palazzo del Sol's various luxury common areas, which include an aperitivo bar, hair salon, massage rooms, theatre and children's playroom, as well as the eight fine dining restaurants, Vanderbilt mansion and pool, golf course, 18 tennis courts, one of the best luxury spas in the Americas, a private beach and day school which are open to all Fisher Island residents. Residences at Palazzo del Sol, Fisher Island are for sale with The Jills and priced between $7.3 million and $22.5 million. This recently completed development on Miami's famous private Fisher Island boasts 43 high-end residences each with access to two private deep-water marinas which can accommodate yachts up to 76 metres. Apartments are available with between three and seven bedrooms, the largest of which come complete with private gyms, terraces and theatres. Every resident also has access to Palazzo del Sol's various luxury common areas, which include an aperitivo bar, hair salon, massage rooms, theatre and children's playroom, as well as the eight fine dining restaurants, Vanderbilt mansion and pool, golf course, 18 tennis courts, one of the best luxury spas in the Americas, a private beach and day school which are open to all Fisher Island residents. 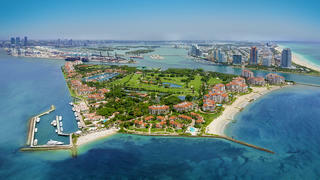 Residences at Palazzo del Sol, Fisher Island are for sale with The Jills and priced between $7.3 million and $22.5 million. This design-led 53-floor development overlooking Miami's Biscayne Bay is ideal for the fun-loving urbanite who also loves to escape out to sea. Six private boat slips are available for use solely by Gran Paraiso residents while jet skis, canoes, kayaks and paddle boards are also available on demand. Each of the two to five bedroom residences also has full use of the Piero Lissoni-designed communal spaces which include a beach club with fine dining restaurant, landscape gardens curated by Enzo Enea, parking valet, spa, fitness centre, juice bar, yoga studio, golf simulator and putting green, private bowling alley, pool, tennis courts, wine cellar and private screening room. Residences at Gran Paraiso are currently available to buy on spec with four-bed penthouses starting at $2,475,900. This design-led 53-floor development overlooking Miami's Biscayne Bay is ideal for the fun-loving urbanite who also loves to escape out to sea. Six private boat slips are available for use solely by Gran Paraiso residents while jet skis, canoes, kayaks and paddle boards are also available on demand. Each of the two to five bedroom residences also has full use of the Piero Lissoni-designed communal spaces which include a beach club with fine dining restaurant, landscape gardens curated by Enzo Enea, parking valet, spa, fitness centre, juice bar, yoga studio, golf simulator and putting green, private bowling alley, pool, tennis courts, wine cellar and private screening room. Residences at Gran Paraiso are currently available to buy on spec with four-bed penthouses starting at $2,475,900.